Yes, a Pez dispenser! You know, those colorful little plastic pocket devices created in the likeness of an endless stream of cartoon, video game, movie, and other characters that serve up pieces of delicious candy simply by pushing down on the tops. You know, of course, the importance of social media and for establishing a presence on sites like Facebook, Twitter, LinkedIn, and Google+. The point on each site is to collect followers and connections for your brand and then use your new network to share content and information, and gather data and feedback from your audience or customers. But in order to convince people to follow and network with you, it is important to create a social media presence that makes people want to connect with you and to come back again and again for the information you provide. Like a pez dispenser, your social media presence must be a delight to the eye and a constant source of sweet and delicious content, so that your audience keeps coming back for more. Appearance. The first thing that catches your eye about a Pez dispenser is it's design, in the form of a character or pop culture icon ranging from Spiderman to Captain America and from Yoshi of the Nintendo gaming universe to Bugs Bunny. You can add visual appeal to your Facebook account by posting additional photos, maybe a video, and more information about you or your business, or add custom backgrounds to your Twitter account plus a branding avatar. Try adding more details or use a few apps, like Behance's Creative Portfolio Display, to show a portfolio of your work and create a more captivating LinkedIn account. There are many ways to build this kind of immediate visual impact in social media. Consistency. 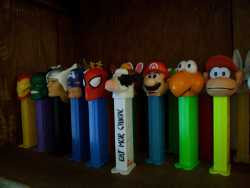 Pez dispensers are much more than cool collectible toys designed like favorite pop culture characters. These nifty little devices also pump out delicious tablet-sized candy for endless enjoyment (so long as you have an endless supply of candy for reload.) Your Facebook or Twitter account are kind of the same. Share interesting posts in your niche (including content from other people, not just from your blog or Websites!) in a tasty stream, encouraging people to like or follow you and eventually learn more about you and your online business. Connection. Hey, this is a matter of individual preference. While my kid may want to collect every Marvel superhero Pez dispenser ever created, I may be hunting for a classic Star Trek or limited edition Elvis collection. In the same way, some people will connect with your social media presence while others may not. Don't sweat it! The most important thing to remember is that social media is not a numbers game. It's about connecting with the kinds of people interested in the things you want to talk about. So, get out there, dive in, and start sharing your own delicious content! Pretty soon you'll be someone's favorite source of information in your niche and they will come back to you again and again.